Here’s a list of some of the top sights in Tuscany. See the views, paintings, and ancient churches that make a holiday unforgettable. And take along your camera for some great photo opportunities. The Duomo of Florence is a spectacular sight. But for a bird’s eye view, head up to Piazzale Michelangelo. Here you’ll see the city spread out below you, and Brunelleschi’s dome rising majestically over the red rooftops. It really gives an idea of the size and scale of the cathedral. And it’s hands down the best view of the city. It has to be one of the most romantic spots in Tuscany. “The Birth of Venus” and “Allegory of Spring” are amongst the most famous paintings of all time. Book your ticket for the Uffizi in advance to avoid queueing. It’s best to go early in the morning and avoid peak season if possible. This way you’ll be able to better appreciate these masterpieces. Despite the crowds, it’s a moving experience. Pure grace on canvas. Renaissance art at its best. 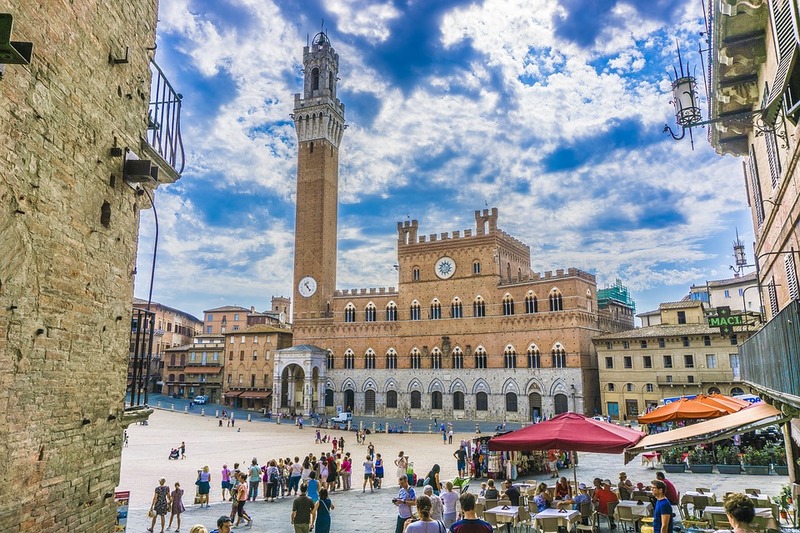 Piazza del Campo in Siena has to be one of the finest squares in all of Italy. Striking Gothic architecture in a spot that’s also famous for the “Palio”, an historic horse race held in the square every Summer. Spend a few hours admiring the gorgeous details of the palaces, or climb the Tower (Torre del Mangia) to take in one of the best sights in Tuscany. Alternatively, join the locals at one of the cafes in the square to enjoy a coffee with a view. It’s iconic, it’s crowded, it’s just plain weird. After centuries this piece of architecture gone wrong is still attracting visitors from all over the world. To climb it isn’t cheap but it’s definitely worthwhile for the view over the Square of Miracles. If you can’t resist picking up a souvenir, there’s plenty of cheap mementos on offer. If a dodgy tower-shaped cup doesn’t interest you, you will also find some more tasteful prints of the Tower. If you’ve got 5 days to play with, this itinerary will show you some of the best sights Tuscany has to offer. The UNESCO World Heritage site of Val d’Orcia offers views that have captured people’s imaginations for centuries. One of them is the Chapel of Our Lady of Vitaleta between Pienza and the peaceful town of San Quirico d’Orcia. This tiny chapel is one of the most photographed spots in the world, and it’s easy to see why. You can drive, or walk, the 4 km between the two towns and see the Chapel on the way. One of the most atmospheric sights in the whole of Tuscany. An enchanting Romanesque church set in the midst of an olive grove, it’s a sight to behold and particularly beautiful at sunset. The Abbey of Sant’Antimo is a very peaceful and spiritual place, though best to visit it out of season. 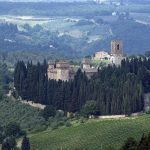 The legacy of the middle ages is clear in the many walled hilltop towns you’ll find dotted around Tuscany. Travel back to Medieval times in one of San Gimignano’s perfectly preserved squares. Explore the narrow stone alleys of Volterra and Cortona. Or immerse yourself in the atmosphere of the Monteriggioni Medieval Festival. October is a great time of year to appreciate the colours of Tuscany. It’s when the vineyards turn yellow and red and make the Chianti landscape look like an oil painting. For more fall foliage experience head to the Casentino region in eastern Tuscany and take a walk in the Foreste Casentinesi National Park, one of the best spots for Autumn foliage-viewing in Tuscany with a rich variety of trees including maple. In northern Tuscany there are the very marble quarries used by Michelangelo when he was choosing marble for his creations (including the statue of David). The white of the stone resembles snow on the mountains tops, and the visual effect is pretty impressive. It’s a place where nature and creativity meet pure hard work. Nearby Pietrasanta is a shrine to marble sculpture. You’ve seen the statue of David in Piazza Signoria. But as you no doubt know, this is just a copy of Michelangelo‘s far more impressive original that stands in the Accademia Gallery in Florence. Is it really worth standing in the queue to see a single statue? Yes, it is. As far as we’re concerned it’s one of the top sights in Tuscany. To help you plan your trip, we’re created a list of the best things to do in Tuscany in 2017. 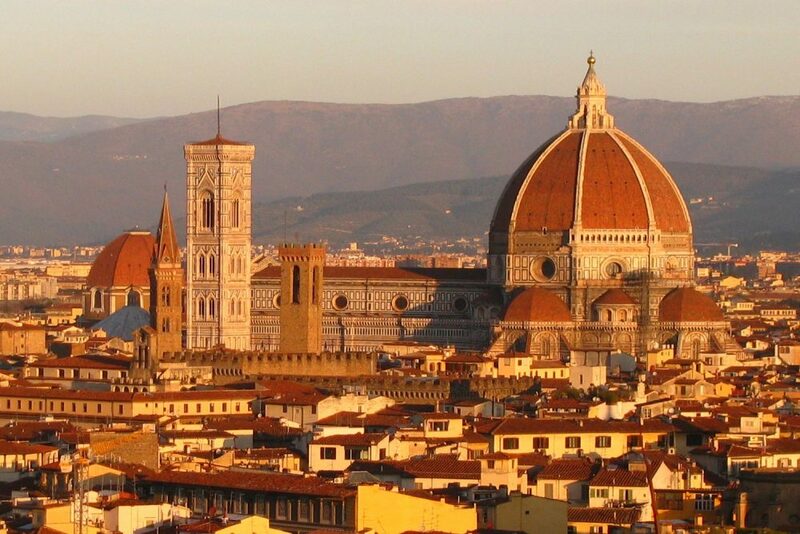 Your friendly online guide to Florence and Tuscany. Get our insider travel tips delivered to your mailbox every month. Share your love of Tuscany! Botticelli The Birth of Venus – What is the meaning of this painting? © 2019 Love From Tuscany.